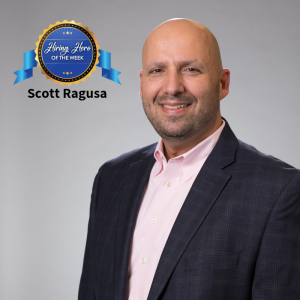 Meet this week’s Hero of Hiring–Scott Ragusa of WinterWyman. As Chief Executive Officer, he leads the firm’s planning initiatives, chairs the executive team, and oversees WinterWyman’s strategic direction and daily operations. He also serves on the company’s board of directors. Under Scott’s leadership, more than 23,000 people were put to work in just the past decade, including more than 2,700 in 2018. This has contributed to consistent year-over-year revenue growth since the last recession, along with a 120% increase in the past decade. It should be no surprise that WinterWyman has received accolade upon accolade. The list includes an 11-time Boston Globe Top Places to Work winner, 16-time Boston Business Journal Largest Temporary Placement Firm awardee, 11-time Boston Business Journal Largest Executive/Contingent Search Firm awardee, 5-time Best of Staffing winner for both client and candidate excellence with NPS scores of 62.5% client (industry average 11%) and 55.1% candidate (industry average 24%). Scott’s contributions to the greater good extend beyond the business world. He raised close to $25,000 as part of the 2018 American Cancer Society’s Real Men Wear Pink initiative, the top amount for the Boston chapter. Thank you Scott for the heroic work you and your team do each day! You can connect with Scott on LinkedIn and Facebook. 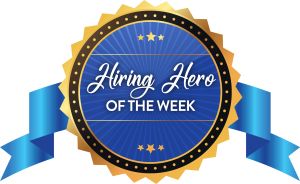 This week’s hero has impacted people across the globe, helping fill jobs that improve and save lives. 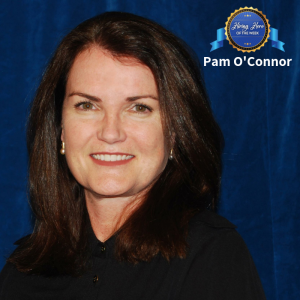 She’s Pamela O’Connor, the Chief Human Resources Officer for Hoyos Integrity Corporation, a secure communications company headquartered in Fort Lauderdale Florida. As a global HR leader, Pam has led the hiring of top talent for emergency relief positions around the world, applying her skill at finding people with the perseverance to perform under pressure and extreme circumstances. She has improved time-to-fill, reducing this metric by more than 45% as a result of initiatives that have significantly increased employee referrals. Employment engagement has also grown under Pam’s watch as she’s overhauled global compensation systems to better align employee expectations with the value they bring to their roles. When asked about her philosophy on recruiting and hiring, Pam said, “I believe in hiring people not just for the current opening, but with the next two jobs they’ll hold in mind as well.” This career minded approach to recruiting along with aligning company strategy with talent acquisition strategy has made lasting impacts. These impacts include making better hires who align well with company goals, reducing talent acquisition costs, and improving employee retention. Thank you Pam for the heroic work you do each day! You can connect with Pam on LinkedIn. Personally finding jobs for more than 10,000 people; running a firm that’s helped 100,000 individuals find jobs; writing 4 bestselling job search books. 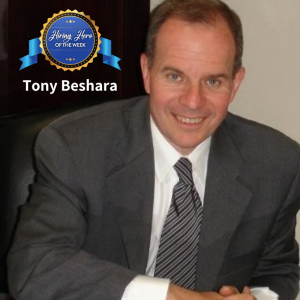 These are just some of the results of the work of this week’s Hero of Hiring Tony Beshara. Tony has been a recruiter since 1973 and is the owner and president of Babich & Associates. Established in 1952, it’s the oldest placement and recruitment service in Texas. Tony’s reach in helping jobseekers also includes hosting a daily radio show on Dallas’ KVCE, “The Job Search Solution.” Thank you Tony for the heroic work you’ve done (and continue to do) throughout your impressive career. BTW You can learn more Tony’s work and connect with him through his website. The valuable work of the Heroes of Hiring often has an immeasurable impact. 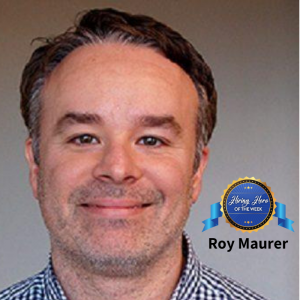 That’s certainly true of this week’s Hero Roy Maurer. Roy covers talent acquisition for SHRM Online. He’s on the front lines of recruiting and hiring, bringing an expansive view and perspective to thousands of people across the globe. Because of Roy’s work, readers stay well informed and make better choices. From recent trends to legal considerations to best practices changes and more, Roy is helping those touched by his work seize opportunities, avoid pitfalls, and improve how they recruit, hire, and retain top talent. Thank you Roy for the heroic work you do every day! P.S. Roy maintains an active presence on social media (not surprising). Follow him on Twitter and LinkedIn. 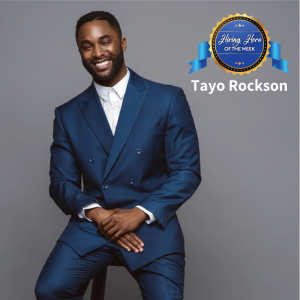 If you don’t know the name Tayo Rockson you should and do now. He’s using his difference to make a difference (those are his words and I love them). Tayo is a diversity and inclusion expert who has lived and worked on four continents. He’s credited with having built high performing cross-functional teams in startups and multinationals. Tayo also leverages his acumen in cross-cultural communications to guide those he serves in developing global mindsets and strategies to become more inclusive. Another part of his service to the global community is his popular podcast–As Told By Nomads. Thank you Tayo for honoring the beautiful differences among us and for using your difference to do heroic work each day! P.S. Connect with Tayo on LinkedIn and Twitter, and be sure to listen to his podcast. 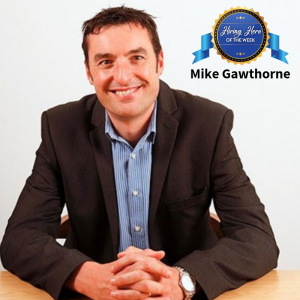 Meet Mike Gawthorne, this week’s Hiring Hero. Mike is the CEO of UK-based Serocor Group. What makes the work of the business units within Serocor heroic is how they go beyond providing talent. They unselfishly delivery expertise, even to companies that aren’t paying customers. “Our recruiters are a combination thought leader and matchmaker,” shared Mike. “Their job is to constantly deliver value to everyone they’re in contact with. This starts with prospective customers. We share market intelligence and best practices. If a company elects not to work with us, they’re still better off from having interacted with our team.” Spoken like a true hero. Thank you Mike for your generosity and the heroic work you and your team do each day! BTW…Be sure to connect with Mike on LinkedIn. A common trait among the Heroes of Hiring is how they work tirelessly to improve results. This week’s hero, Shahid Wazed, is the embodiment of this attribute. 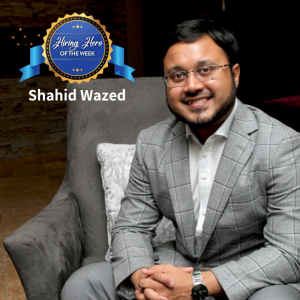 Shahid is a recruitment automation pioneer, having developed sourcing strategies that have reduced effort, increased hiring speed, and cut costs (he recently brought in top talent for hard-to-fill position for just $52). He’s also the Host of the Top Talent Summit, a talent acquisition event in its sixth year serving the Canadian talent acquisition community. If that weren’t enough, he’s a Forbes Contributor, a member of the Forbes Human Resources Council, and an award winning podcaster. Thank you Shahid for your tireless efforts and the heroic work you do each day! P.S. Be sure to connect with Shahid on LinkedIn. When you spend 20+ years driving the education of industry professionals you get to shape many careers and lives. That’s just the start of what Tracy Rettie has done. She’s the Vice President, Education and Strategic Initiatives for the American Staffing Association. 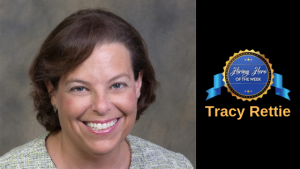 From owners and executives to those just starting out in the business, tens of thousands of people are succeeding in the noble work of staffing because of Tracy and her team. 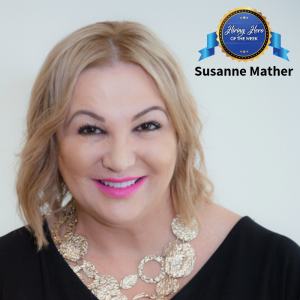 She is shaping the present needs and future success of the staffing industry through her leadership of Staffing World professional development offerings, ASA certification programs and webinars, and the Safety Standard of Excellence program. Thank you Tracy for the heroic work you do each day. P.S. I hope you’ll connect with Tracy on LinkedIn. 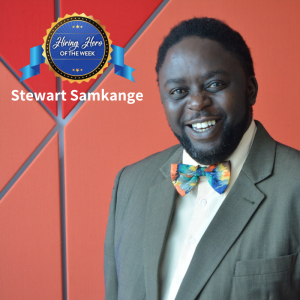 Meet Stewart Samkange, this week’s Hero of Hiring. His stated mission is to “make the ‘working-world’ a better place.” Stewart is doing that through his work with LinkedIn (he provides talent solutions for Africa to help HR Directors plan, develop, and hire) and his thought leadership. What makes Stewart a powerful presence for change and improvement is what he shares with the world, how he shares it, and the conversations he’s able to create. When you scroll through the content he posts you’ll see what I mean (click here for an example). Stewart says that one of his secrets of success is that he’s “bold, ambitious, and disarmingly honest.” Yes he is, and we could use more of that in our world. Thank you Stewart for being a role model and for the heroic work you do every day! BTW…you can find the valuable content I referred to on Stewart’s LinkedIn page.